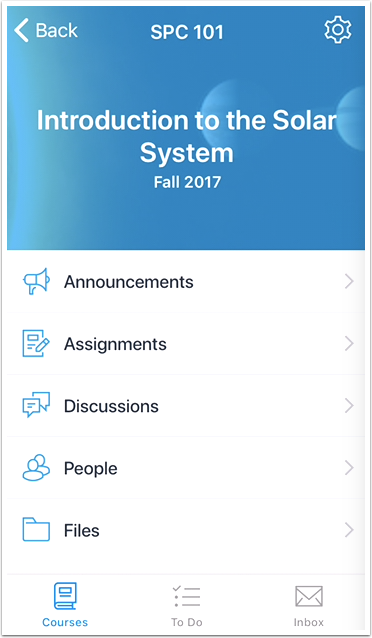 You can view all your active courses in the Canvas Teacher app. The app defaults to the Courses tab and displays all your Favorite courses. Favorite courses mirror the courses customized drop-down menu in the web version of Canvas. To view all your courses, tap the See All link . 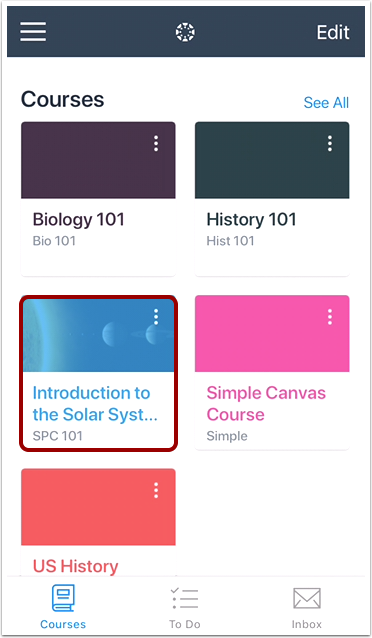 The app displays all your courses in one page. To return to the favorites view, click the Back link . Favorites can be managed from the Courses tab. 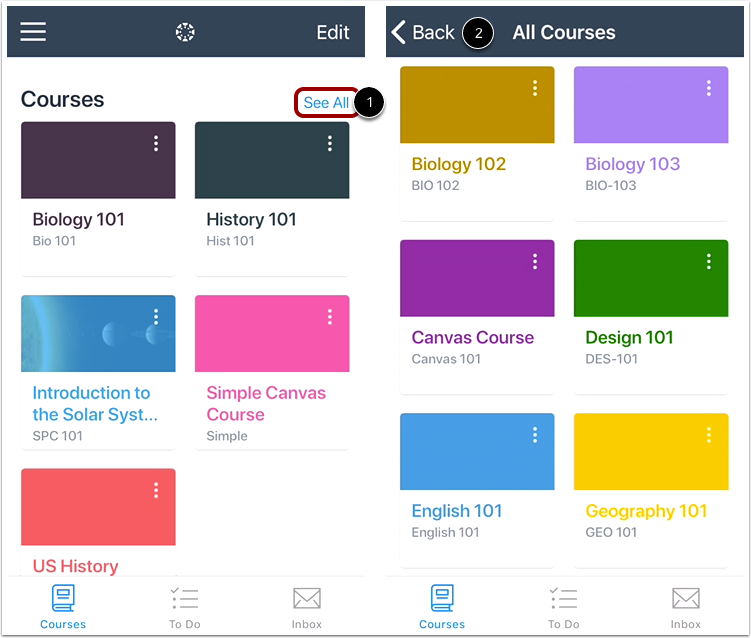 Changes to your favorite courses will also apply to the browser version of Canvas. Tap the star next to the course you want to favorite or unfavorite. You can view and change several options for your course cards by tapping the More Options icon. If one of your courses includes a long or confusing name, you can create a nickname for your course. 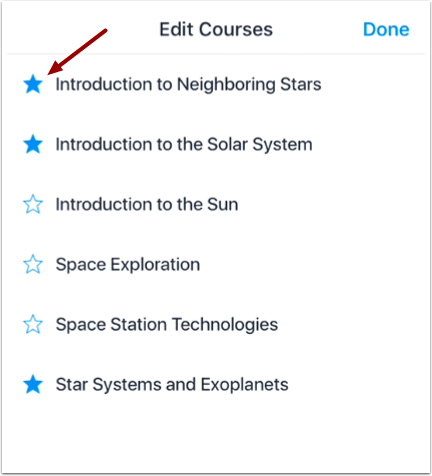 Course nicknames appear in the Dashboard, Course Navigation Menu, and the Inbox. To set or change a nickname for your course, tap the Nickname text field  and enter your preferred nickname. A course nickname does not affect the course name for any other users; it only changes the name of the course as seen by you. In the color list, a check mark indicates the current color shown for the course. 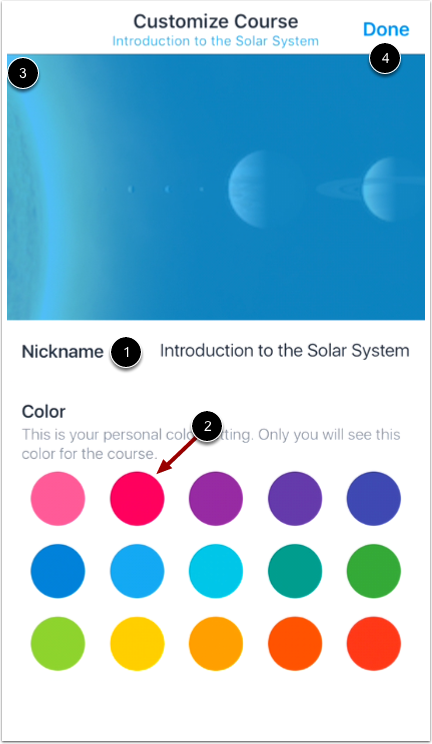 To choose a new color for your course, tap the a new color . You can view the new color in the course card preview . If your course card contains an image, you can view what the color looks like over the image. Tap the Done link . Within each course, you will be able to view the course navigation links available to you. Not all course navigation links are supported in the Teacher app. Note: If it has been enabled in your course, the Attendance tool will display as a course navigation link. Previous Topic:How do I act as a user in the Teacher app on my iOS device as an admin? Next Topic:How do I edit course settings in the Teacher app on my iOS device? Table of Contents > Courses > How do I view Courses in the Teacher app on my iOS device?